Operators of small horse farms rarely struggle to identify individual animals. 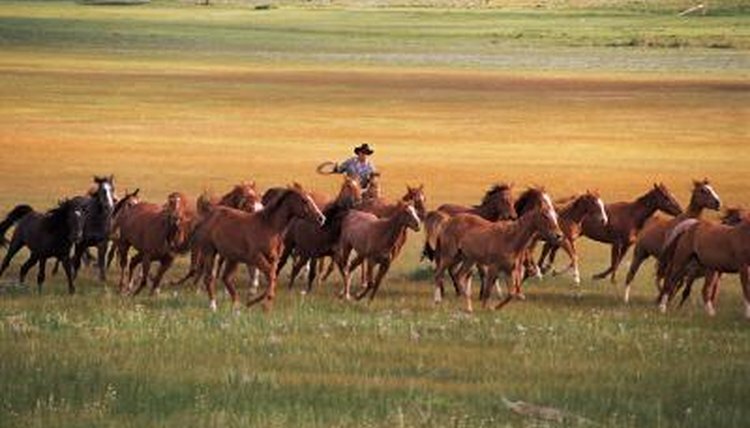 Even a tenderfoot horse enthusiast can tell a handful of equines kept in the same pasture apart from one another just by gender, coloring, markings and size. However, large operations that deal with hundreds of animals cannot correctly identify individual horses on sight. In such cases, horses have to be marked for easy identification. Numbered neck straps serve to identify individual animals in a herd setting. They are commonly used in auctions and breeding operations. The tags make it easier to identify individual horses, particularly for those with nondescript physical markings who might otherwise be confused or misidentified. Each animal is assigned a specific number. Straps are made of leather or plastic. Identification information is printed directly on some straps; on others, it's printed on a tag attached to the strap. Such straps are made to break if it causes the horse to become snared. They are considered safer than traditional halters. Identification straps go around the very top of the necks of horses, near the throat. The straps are snug but not tight enough to cause discomfort or damage to the skin. Leather straps are designed to stay on the horse for a longer period of time than plastic straps. Plastic straps typically serve for short-term purposes of identification, such as when a horse is run through a livestock auction. A package of neck identification straps is useful to have in your emergency preparedness kit. Identification straps quickly and easily attach to animals, suitable if you are in a situation whereby your horses may become lost in fray or escape. Horse owners who live in wildfire- or hurricane-prone areas should keep a few sets of identification straps and tags on hand at all times in case an emergency arises and horses wind up on their own. The tags on the identification straps should list your contact information as well as an out-of-area contact in case communications in your area are down.